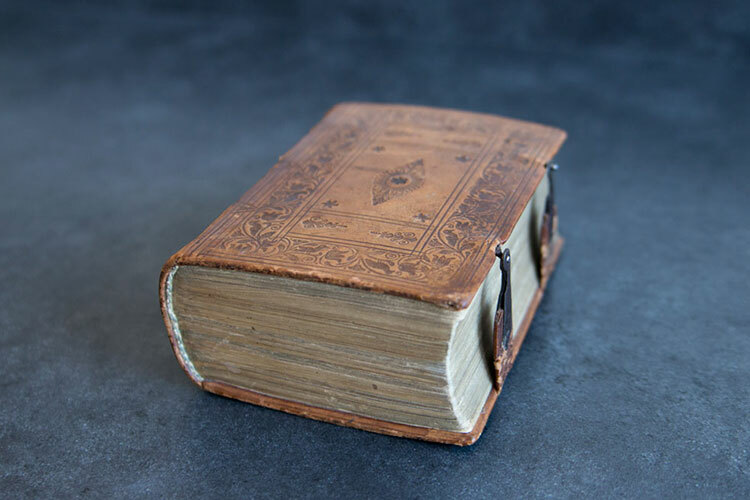 The latest addition to the Nelson Memorial Library is a Latin Bible from sixteenth century Venice, Italy. The Bible has ties to PUC, having passed through the hands of two different alumni couples before being donated to the college. Printed in 1519, the Bible contains a plethora of surprises. Considering its age, it is in excellent condition. Slightly larger than pocket-sized, it has woodcuts throughout, depicting various biblical stories, as well as a few words and paragraphs in red. It contains the Apocryphal books, and the binding features functioning metal clasps. Marbled end pages and some noticeable cropping indicate the Bible was likely rebound sometime in the seventeenth or eighteenth century. Written in the margins of several pages are notes in Latin and Italian, though they are faded and difficult to read. The printer’s colophon on the last leaf was translated by Reverend Augustine De Noble, OSB, from the Mount Angel Abbey in St. Benedict, Ore. He has also translated many of the marginal notes made by previous owners. The colophon indicates the Bible was printed on October 15, 1519, in Venice at the commission and expense of Luce Antonius de Giunta, a Florentine gentleman. While plans are still being made to display the Bible, along with several others in the Library’s collection (of which the new acquisition is now the oldest), professors are already taking advantage of having this exciting resource on campus. Dr. Heather Reid, Medievalist and professor of English, recently had her Renaissance Literature class view the Bible for an example of the transition from manuscript to print culture following the invention of the printing press. The early typeset emulates late medieval textura script. She also plans to use it in a manuscript and bibliography workshop for her Medieval Literature class, and hopes the departments of visual arts and theology will also utilize the Bible for the woodcuts, glosses, and marginalia found throughout. The Bible was donated to the college by S. Wayne Young and his wife Vonnie (Hilliard), both of whom graduated from PUC in 1965. It was presented to the couple in 2006, when Young was a pastor at the English Oaks Seventh-day Adventist Church in Lodi, Calif, from Dr. Ezekiel Ramirez and his wife Loretta (Fickess), who had been gifted the Bible during their time at the U.S. embassy in Spain. The Ramirezes are also graduates of PUC, from 1936 and 1949, respectively. Thanks to the generosity of these two couples, the Bible can now be enjoyed by hundreds of PUC students, faculty, and staff, and the surrounding community. The Nelson Memorial Library is always looking to add to its expansive collection and preserve PUC’s rich heritage. Photographs, papers, letters, recordings, old yearbooks, and newspapers are greatly appreciated. If you have a piece of PUC history you would like to share, please contact Special Collections Librarian Katy Van Arsdale at kvanarsdale@puc.edu or call (707) 965-6244.